This description demonstrates how to get RTSP headers from IP cameras in C#. The RTSP provides real-time transfer for media streams between a camera and the Ozeki Camera SDK software. In order that clients begin video and audio streams they get RTSP messages which include RTSP headers. Every headers have their own values and meanings. Request: It contain the different RTSP protocol methods (e.g. option, describe, setup, teardown, play, pause). CSeq: The CSeq field specifies the sequence number for an RTSP request- response pair. This field MUST be present in all requests and responses. For every RTSP request containing the given sequence number, there will be a corresponding response having the same number. User agent: This field contain the name of the clint who connect to the software. Date: This field contain the exact date and time. Public: It contain the different RTSP protocol methods e.g. option, describe, setup, teardown, play, pause). www- Authenticate: This field requests the client to to identify itself. www- Authorization: This field allows the client to identify itself (or its user) which requires authentication. How to get RTSP headers? To send a control request, the client constructs a line consisting of the method, the request URL, and the procol version number. Then it includes a general header, a request header and possibly an entity header, as for the http protocol. This is sent to the server, who executes the request if possible. It then returns a response containing a status-line and general, response and entity headers. The status line contains the protocol version, the numeric status code and a textual description. RTSP message is the basic unit of RTSP communication. 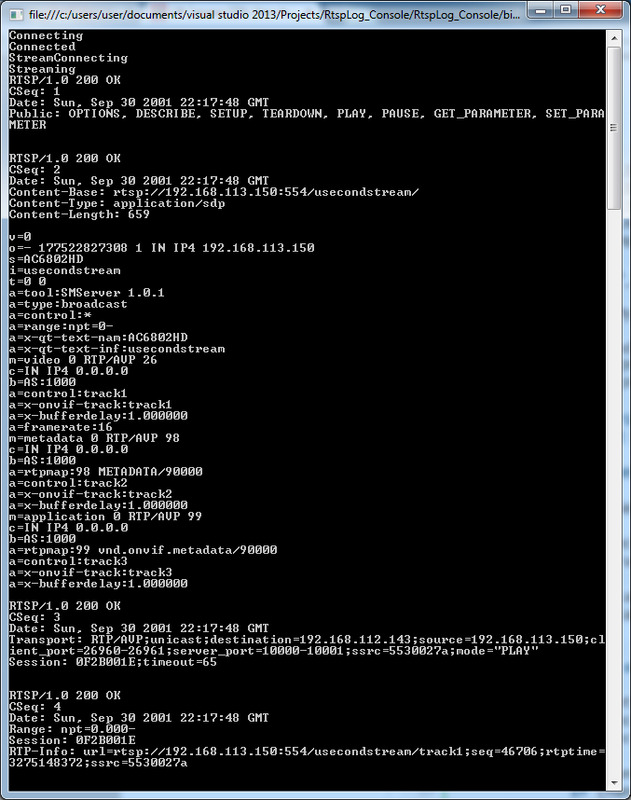 RTSP messages contain RTSP headers which are used for defining request and response messages. Can I read the RTSP head request messages if I use IP Camera? Yes,you can read the RTSP head request messages.